Good lighting is essential on any jobsite, which is why I am always happy to see an announcement for new jobsite lighting, especially LED lighting. We have been stuck with hot halogen lights for far too long. 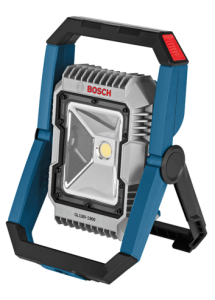 What makes this announcement from Bosch unique is that one of their lights (GLI18V-1900C) features Bluetooth connectivity for remote controlled operation. With the corresponding app, users can manage several of the lights simultaneous with one click. Since the new Bosch LED floodlight uses the latest in Bluetooth technology, it uses very little power to connect with the app. If Bluetooth is not your thing, you can save $20 and get the GLI18V-1900N, which is nearly identical in every other way. I say nearly because the Bluetooth model also has the added advantage of IP 64 rated protection from dust and water. Other than that, both models have brightness levels of 1900 lumens and 1000 lumens, with a runtime of 4-hours on high and 8-hours on low (when used with a 5Ah battery). It looks to offer a more compact design that other LED floodlights on the market—which I feel it a huge bonus—but it provides the versatility of 120-degrees of angle adjustment over 5 set positions. Another bonus is the addition of a standard 5/8" tripod thread for mounting. If you are interested in any of the new Bosch LED floodlights, the price of the GLI18V-1900 is listed at $99, while the Bluetooth model GLI18V-1900 C is listed at $119. Update: I came across a couple of videos from Bosch UK that showcase an additional feature that is worth mentioning, and that is a low battery warning. It also seems that the app can control lights individually as well as in groups that you can assign. Check out the videos below.